CuFe2O4 nanoparticles were prepared by co-precipitation method. After the characterization of nanoparticles by XRD, SEM, EDS and TEM, their catalyst activity was investigated in the synthesis of β-acetamido ketones. CuFe2O4 nanoparticles were introduced as a recyclable, inexpensive and nontoxic catalyst in a four-component reaction of aromatic aldehydes, enolizable aromatic ketones, acetyl chloride and acetonitrile at room temperature. 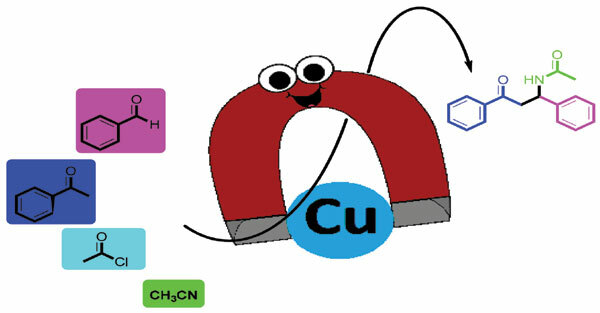 Heterogeneous nanocatalyst, synergistic catalyst, copper ferrite nanoparticles, Dakin-West reaction, β-acetamido ketones.